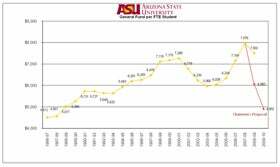 The funding lost in the recently revised FY09 state budget has forced Arizona State University to cap enrollment and to close applications to next year's freshman class on March 1, five months earlier than usual. In exceptional cases, applications will be accepted after the March 1 deadline, although admission would be limited to ASU's University College. ASU is also closing about four dozen academic programs, many on the Tempe campus, and scaling down administrative operations at its Polytechnic and West campuses, in response to state budget reductions, which have totaled $88 million or 18% of the university's base state budget since June 2008. The social work program in Tucson will also be closed, and ASU is also suspending funding of its AIMS scholarship program. All students currently enrolled in programs that will be closed will be able to complete those programs within a reasonable amount of time. In seeking every possible cost savings, the university has essentially been able to protect its academic programs until now, but the revised FY09 state budget enacted at the beginning of the month has made that impossible. Additional cuts in state funding in FY 10 would force ASU to consider additional staff layoffs, a substantial increase in tuition and fees, further limitations on student enrollment, and closing the Polytechnic and West campuses entirely. "For the past seven years ASU has expanded its enrollment, added new academic programs and enhanced quality and productivity at every level to serve the people of Arizona better," said ASU President Michael M. Crow. "Making cuts of this sort now is extremely painful to all of us at ASU but we have no choice. No university, no public institution, no corporation, no individual can sustain the drastic budget cuts we have taken without reducing its programs and activities. And I must emphasize that these changes are what we have had to do to cope with state budget cuts this year and would not be sufficient to deal with a possible further reduction in state funding in FY10." The College of Technology and Innovation becomes the sole remaining college. The school's Nutrition and Exercise and Wellness programs will become part of the College of Nursing & Healthcare Innovation on the Downtown campus. The College will be renamed to become the College of Nursing and Health Innovation in light of its broader mission. The school's remaining arts, humanities, social science and science programs will continue to be taught at Polytechnic campus but will be administered, respectively, by the Herberger Institute of Design and the Arts (Tempe campus), the School of Letters and Sciences (Downtown campus), and the College of Technology and Innovation. The Morrison School of Management and Agribusiness will merge with and will operate as part of the W. P. Carey School of Business. The unique mission and identity of the Morrison School will be preserved, and all Morrison School tenured and tenure track faculty members will retain their positions. Current plans call for the Morrison School faculty and staff to continue to remain in their facilities on the Polytechnic campus. The Fire Service Management program will be closed*. The Nursing program, which had previously been reduced from 80 to 40 students, will be moved to the Downtown campus. No graduate degree programs, including the W. P. Carey MBA, will be offered at West. The New College of Interdisciplinary Arts and Sciences will be the lone remaining college at the West campus. The Nursing program at West, which had previously been reduced from 80 to 40 students, will be moved to the Downtown campus for fall 2009. The College of Teacher Education and Leadership will move Downtown, although undergraduate courses will continue to be taught on the West campus. The School of Social work undergraduate and graduate programs now offered on the West campus will be moved to the Downtown campus and consolidated with that program. The Ira A. Fulton School of Engineering will reduce the number of academic units from 10 to six*. School of Biological and Health Systems Engineering, which includes the Harrington program in bioengineering. School of Sustainable Engineering and the Built Environment, which includes the Del E. Webb School of Construction. The W. P. Carey School's MBA Sports Business Specialization will not be offered after the completion of the 2009-10 academic year. University administrators said they regretted having to make these cuts but the magnitude of the reduction in state funding left no alternatives. The new FY09 budget, after a reduction of $88 million in state funding, reduces ASU's per-student funding from the state general fund to what it was 10 years ago. ASU received $7,976 per student in 2008. The $6,500 per student the university receives for 2009 is only $4 more per student than it received in 1998. In addition to these changes, another three dozen academic programs have stopped taking student applications and the process of disestablishing them has begun (a detailed list is attached). More than 550 staff positions have been eliminated, including four deans' positions and almost two dozen academic department chair positions. More than 200 faculty associate positions have been eliminated. Ten- to 15-day furloughs have been implemented for all employees, including the president, provost, vice presidents, deans, varsity coaches and faculty. The number of nursing students the university can admit has been reduced by 80 a year, decreasing the total number of nursing students in the four-year program from 2,000 to 1,640. A wide variety of cost-saving measures, from the reduction of purchases, to energy conservation to a hiring freeze, have been implemented. The School of Global Management and Leadership at West was merged with the Carey School. The School of Criminology and Criminal Justice and programs in the Department of Recreation and Tourism Management at West will be moved downtown in the fall 2009. The College of Technology and Innovation merged six academic departments into three. The School of Educational Innovation and Teacher Preparation is being disestablished and all teacher preparation and undergraduate education programs university-wide will be consolidated into the College of Teacher Education and Leadership. The Mary Lou Fulton Institute and Graduate School of Education is being established to administer graduate-level education programs except those related to teacher preparation*. The College of Design and the Herberger College of the Arts were merged into the Herberger Institute of Design and The Arts*.